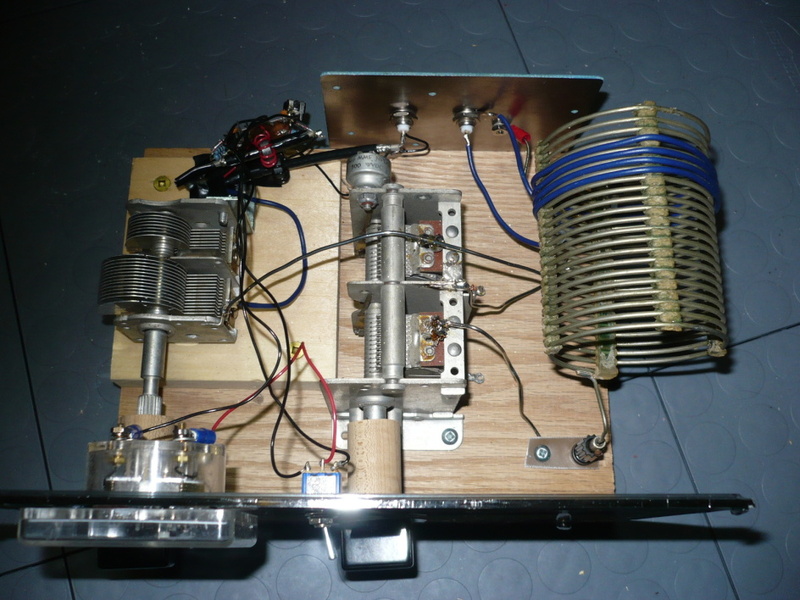 I previously posted that I had finished the Z match antenna tuner unit I was building. I also promised more information later. Here are the details on the tuner itself. The details of the power meter (which gives SWR information) will follow in another post. C1. This is a air spaced capacitor whose value I did not measure, but expect it to be in the 300 to 500pF range. It has two stages, one larger than the other, so it looks like it was from a AM/FM receiver. I just used the larger section. C2. A dual stage capacitor, with identical stages. 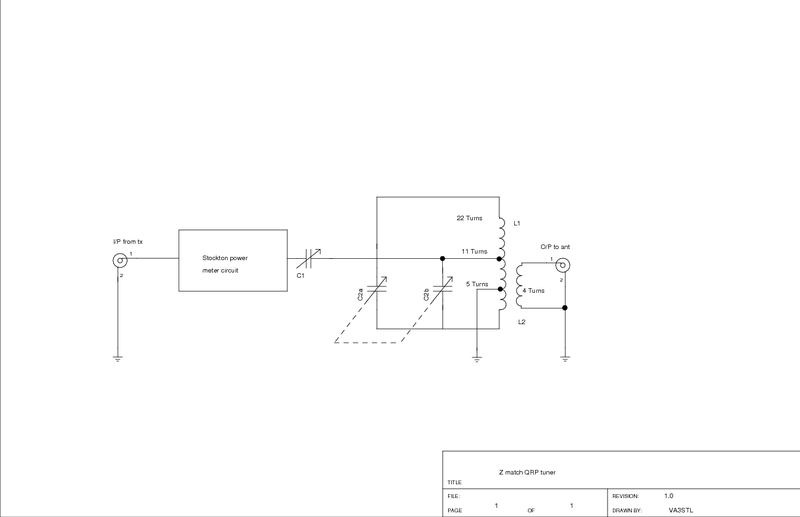 Again I did not measure the capacitance but expect a stage to be in the 300-500pF range. L1. This is an air wound inductor that I picked up, like the capacitors, at a hamfest. This has 22 turns and a turn has a diameter of approx 2 ¾”. Its ends has plug type connectors which fit banana plug sockets, so I used those to hold the coil in position. Taps were placed at 11 and 5 turns. L2. This is plastic insulated wire (blue wire in the photograph below) that I wound directly on top of L1. Four turns have been wound and are centred on the 5th turn link (ie. 2 turns either side of the link connection). Tuner side view shows details of L1 and L2. As mentioned these components were purchased at hamfests, for projects like this, so the exact values were irrelevant, I wanted the largest variables I could find, with one needing to have equal dual stages. The inductor was a nice coil that I saw that I knew from prior reading would be good for element L1. It is worth noting I tried placing 8 turns for L2 initially but found I could only get a match on the bands 40m through to 12m, on my 88ft doublet. I could live without 10m but I did need 80m. After reducing the number of turns to 4 I found I could get a match at 80m. 10m was still elusive but not essential, so I stopped there. I suspect the problem is the minimum capacitance of C1 is too high. For 15m and 12m, C1 was turned towards the minimum and that looked like it was critical. Still, without 10m I was pleased to have a Z match tuner, that worked for my antenna, which only needs two capacitors and not the extra capacitors in parallel that can be switched in to boost the capacitance at the C1 stage. I should mention the capacitor shafts are insulated, this was done with wood dowel and needed because one capacitor had an oversize shaft that would not fit any of the knobs I had. The power meter circuit will not handle high powers. That could be replaced with a conventional SWR meter prior to the ATU. The capacitors are likely designed for use in receivers, so the plates are closely spaced. The gives rise to a possible ‘flash-over’ or arcing under certain conditions. L2 is wound directly on L1. If L1 gets hot then this could cause damage to the insulation of L2 and then problems could develop. During the testing stages I was running a couple of Watts from my K2 and I found no evidence of heating in L1. No doubt I am using this tuner well under its power handling capacity, but I am hoping that the air coils will give me some added efficiency to get the most out of my QRP signal. Here are some web sites I have found on Z match tuners which may help with more background material. (Don’t forget to check Phil Salas’s QST paper too) . The simple Z match tuner simplified. Lloyd Butler Vk5BR – a great starting point for single coil Z match tuners. Check the links at the bottom of that page. Efficiency of the Z match. 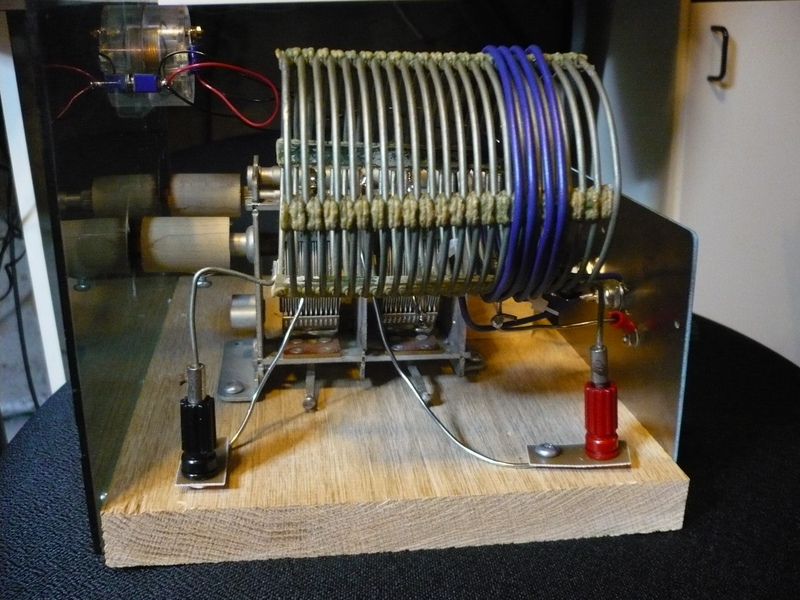 Lloyd Butler VK5BR – Good details on the efficiency of the Z match across the bands. FRI-match ATU , a single coil Z match type. Frits Geerligs, PA0FRI – Some great information on a Z match variant. I found this site after building my Z match. Below is a photograph looking down on the tuner. The power meter circuit is at the top left of the board, which is wired to the front panel meter and the switch which selects forward or rreflected power. More on that circuit will follow. Finally, I hope the details inspire you to try building your own tuner, be it a Z, T, Pi or L match. Research the tuners and then have fun looking for components at hamfests. Then the real enjoyment is using the components you have found and putting them together to work for you. Hi, nice article I am using a single coil tuner too. Like the dowel to attach to the knobs.